In Inventing With Arduino, a course offered through the Pacific Ridge After-School Extension Program, students are laying the groundwork to develop their own gadgets, products, and inventions. Arduino, an open-source electronic prototyping platform, allows for the creation of interactive electronic objects. 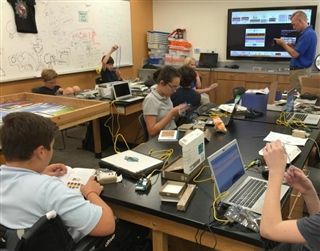 Under the guidance of Carl Demolder, a UCSD engineering student, the class is exploring the basics of creating circuits with the Arduino prototyping board, and developing an understanding ofconcepts including voltage, current and resistance, programming, sensors, and more.